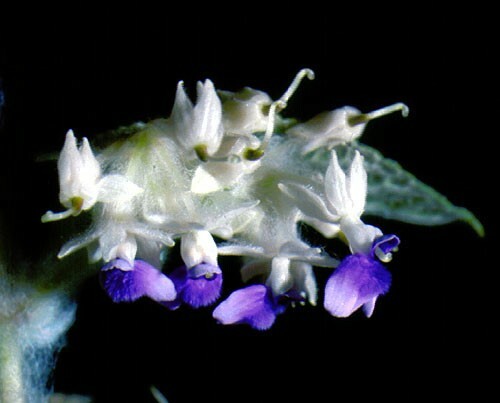 With few exceptions, the flowers of Gesneriaceae are cross-pollinated and animal-pollinated (zoophilous), with insects (mainly bees), birds and bats acting as pollen vectors. The evolutionary diversification of the family, the speciation, and the evolution of a vast diversity of flower forms are closely linked with the mode of pollination. Field studies on pollination have been performed to a limited extent, and much work remains to be done. Nonetheless, some major trends have been explored or can be concluded from the flower characters and pollination syndromes. enantiostyly (left-right-position of the style combined with a reciprocal position of the anthers). Protandry dominates by far in the Gesneriaceae, while protogyny seems to be restricted to some bat-pollinated species of Gesneria. Enantiostylous flowers occur in Didymocarpus, Henckelia and Streptocarpus section Saintpaulia (now included in Streptocarpus, Nishii et al. 2015). As far as can be inferred from the floral characters (pollination syndromes), animals involved in pollination include insects, birds and bats. Regarding the insects, bees (Apidae, including the Euglossini in the neotropics, Anthophorini, probably Xylocopini and others) play the dominant role. Pollination by butterflies seems to be rare and the same holds true for moths and dipterans. Wasps, gnats, hover flies and other unusual flower-visiting insects are possibly involved in pollination as well, but certainly play an insignificant role. The majority of the Gesneriaceae species has flowers that are devoid of any floral scent, and attraction of pollinators is primarily by visual cues. This particularly holds true for the ornithophilous (bird-pollinated) flowers. However, for a number of species (from c. 15 genera, essentially neotropical) fragrance has been reported (Boggan 1996). The range of odors is surprisingly wide: sweet honey-like, lemony, musky, clove-, cabbage-, carrion-like and others. Scent seems to be addressed to special pollinators: e.g., Sinningia tubiflora to moths, with powerful lemony fragrance, or Kohleria tigridia to bats, with cabbage-like scent. Fragrance has also been noted in some paleotropical species, such as Streptocarpus vandeleurii. The kind of fragrance addressed here serves for long- or short-distance attraction of pollinators. This must be distinguished from a different kind of fragrance (“perfume”), found in the so-called perfume flowers: this serves both for attraction and as a floral reward collected exclusively by male euglossine bees (see below). Nectar flowers. Corolla with a distinct (often long) tube, coloration conspicuous (pale for night pollination, bright for day), limb zygomorphic, nectar-secreting disc present, nectar often accumulating in distinct bulges at the corolla base; pollen sticky. Deceptive nectar flowers. The flowers exhibit the general habit of nectar flowers, but the nectary, if present at all is non-functional. The flowers of some species of Ornithoboea may belong to this type: by the spreading calyx and the corolla shape, they strongly resemble orchid flowers. They may indeed mimic orchid flowers (Calanthe? ), but at least bear the general habit of nectar flowers. Flowers of Ornithoboea arachnoidea appear to mimic those of some orchid species. Pollen flowers. These exhibit the general character syndrome of oligandric pollen flowers: nodding flower position; corolla short-tubed, campanulate or flat-faced with (sub)regular limb; stamens sometimes five, anthers ± exposed, large, sometimes forming a cone or coherent, often bright yellow or orange, dehiscing by apical pores or transversal slits, pollen non-sticky, powdery; nectary non-functional or reduced. Flower exploitation is apparently by buzzing, whereby the buzzing of the bee pollinator causes the pollen to be shed. Striking examples include Saintpaulia, Ramonda, Conandron, Didymocarpus cordatus, Bellonia, Niphaea, Phinaea and Napeanthus. Partially and fully deceptive pollen flowers. Simulation of copious pollen is by (a) yellow anther walls (e.g., Saintpaulia: by the robust, yellow wall the anthers are attractive for a much longer time than pollen is available), (b) a yellow blotch on the corolla above the anthers (e.g., Petrocosmea kerrii), (c) yellow filament knees (e.g., Loxocarpus caeruleus: exserted filaments with yellow knees, the true anthers are of cryptic colour), (d) yellow blotches on the corolla near filament insertion (e.g., Codonoboea puncticulata, (e) a patch of yellow, moniliform hairs at the palate (plastic imitation of pollen grains? : Stauranthera), or (e) an exserted yellow style (Codonoboea geitleri: style studded with yellow glands). Perfume flowers. This flower type is known from Gloxinia perennis (discovered by Stefan Vogel 1966), and (probably) Monopyle. The corolla is rather short- and broad-tubed, and an osmophore (tissue producing the fragrance) is present near the base, replacing the nectary. The osmophore consists of palisade-like, purple-brown epidermal cells that secrete tiny droplets of terpenes that are collected by male euglossine bees. 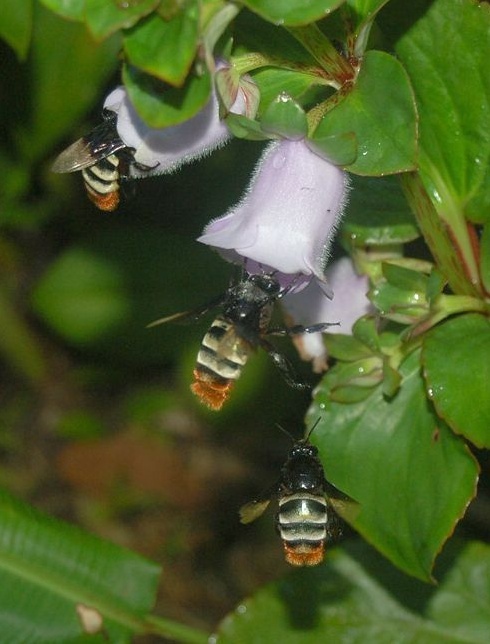 Male euglossine bees (Eulaema meriana) collect a perfume substance from Gloxinia perennis, and then use the perfume to attract females to a mating site.